Garbage disposals are broadly classified into two different variants and these are: batch feed and continuous feed. Based on your frequency of usage, type of food wastes disposed and personal preferences, either one can be the ultimate pick for your kitchen. However, what exactly is the difference between the both and why should you be aware of them? Well, understanding how these garbage disposals differ from one another can apparently help you in figuring out the right variant that you must install. Thus, here we provide a complete overview of batch feed and continuous feed disposer to help you take an informed decision. Batch feed, as the name implies works in batches. This means the food wastes are loaded in batches so as to be processed. The first step is to fill the disposer chamber with food scraps and when its full, a plug or stopper is placed on the tank (the mouth of disposal unit). Then this stopper is twisted and pushed down in order to switch on the unit. After grinding is done, the stopper is lifted and the disposer stops. In case, you have more wastes to grind, you just have to repeat the cycle once again. Children will not be able to put their fingers when the disposer is running, because the stopper acts as a barrier. There is absolutely no chance of utensils dropping into the unit and this prevents damage to the grinding component and other parts of the unit. Disposer comes with a cover that ensures solid wastes do not clog the drainpipes as a result of which you can cherish seamless operation. Low noise: Since the stopper covers the mouth of the disposer it reduces unwanted noise produced while grinding and offers quite and clam operations. Time consuming: You have to manage food wastes in batches, this means the more waste you have, the more time it will consume. This can turn out to be a tedious process, especially for those with large families or during parties. Large size: The size of batch feed garbage disposers is usually larger when compared to continuous feed disposer. Moreover, most of the modern kitchens are not able to accommodate the unit only because of their bulky structure. Inconvenience: If you lose the stopper then won’t be able to operate the unit unless you find a replacement for the part. You have to preserve the stopper, as when misplaced then dealing with food scrapes would become a nightmare. Continuous batch feed is an effective unit that disposes wastes even while it is running. So, you can drop the scraps continuously without having to accumulate it in batches. Just turn on the switch, and the grinding component will start to do its wonders, and when you are done then switch it off and you are good to go! Speed: The speed of continuous disposer is a major pro that makes it so popular. Only turn on the machine and leave the rest to it. Further, the advance models are equipped with effective grinding technology that is capable of chopping down tough (chicken bones, small bones), fleshy particles (leftovers) and fruits and vegetable peels in no time. Efficient: Being continuous appliance, you can easily toss various items into the sink while doing your usual chores. This saves a lot of time and effort than you would probably have to make in stopping a particular task and then tuning on the disposer to process the waste. Affordable: The continuous disposers are relatively cheaper compared to their counterparts. Plus, they are lightweight, compatible and available in different sizes too. All you have to do is consider the measurements of your sink and then search for the perfect match. Lack of safety: For continuous operation, the drain sink is not covered while grinding wastes and this leads to safety concerns. You might drop down foreign substances that would affect the quality of the disposer or accidentally hurt your fingers while managing them. Necessary precautions and proper operation is essential when you use the appliance. Food splashes back: The open mouth even triggers food to come out if it has been blocked by too much or rigid wastes. A splash guard is often used to overcome this issue. But, if not maintained or replaced on time, this can become troublesome as well. Popularity: In terms of popularity, continuous feed has always been on the top of list. This primarily due to its ease of use, versatile design and advance features. Usability: Though both are meant for disposing food wastes, but when it comes to batch feed then the process turns out to be bit complex, where you have to stuff the chamber, place the stopper, wait for it to grind and then repeat the cycle. 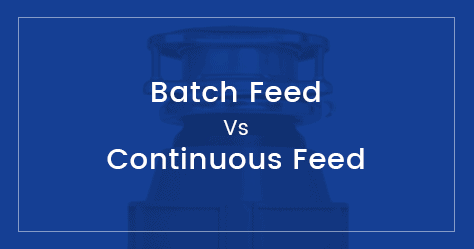 Perks: Though batch feed units lose their points due to lack of convenience, yet they come with added safety which is not seen in continuous feed. Hence, if the latter is not used carefully then you would make yourself prone to serious hazards. Cost: As stated, the continuous feed is an affordable option than batch feed and this is the reason why it is commonly preferred by households. At last, whether it should be continuous or batch feed is determined by the requirements of your home. Because at the end of the day, it’s all about models and choices, but you should be satisfied with the appliance that you choose.